Formed in 1913 by the California Legislature, Reclamation District 999 is responsible for protecting the lives and property within our borders. We provide flood protection by maintaining 33 miles of levees, 260 miles of ditches and canals, and 15 discharge pumps. 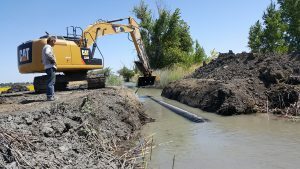 Drainage and irrigation pipe replacement. We also provide irrigation for most of the 22, 400 farmable acres in the district. 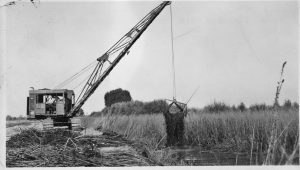 To do so, we maintain 5 inlet stations which can draw water from the Sacramento River, Elk Slough, Sutter Slough, and the Sacramento Deep Water Ship Channel to fill our network of ditches and canals. 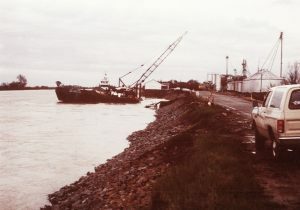 Levee repair north of Sugar Beet Factory, February 1986. Levee maintenance primarily includes mowing levee slopes, tree trimming, weed control, rodent abatement, crown road maintenance, erosion repair, and routine inspections. Ditch maintenance requires vegetation control, cleaning, deepening of the waterways and the maintenance of pipes, gates, risers and pumps which connect them.